The risotto is nearly done, then the phone rings and the next thing you know, you've got a mess to clean. Scorched foods can leave stubborn spots in pots and pans that no amount of elbow grease can remove. But just a few essentials in your pantry will help restore your pans to practically new. Wash away as much of the food as possible, using cold water for eggs, chocolate and starch-based foods. Fill the pot with water. Add 1 to 2 tsp. dishwashing liquid and bring to a boil. Simmer for 10 minutes, then cover the pot, turn off the heat and leave the pot to soak for 30 minutes. With a wooden spoon, scrape away as much of the burned food as possible. Rinse well. If burned areas still remain, cover them completely with a generous amount of baking soda. Drizzle in just enough water to create a thick paste, smearing the paste up the sides of the pot if needed. Set aside for at least 4 hours, preferably overnight. 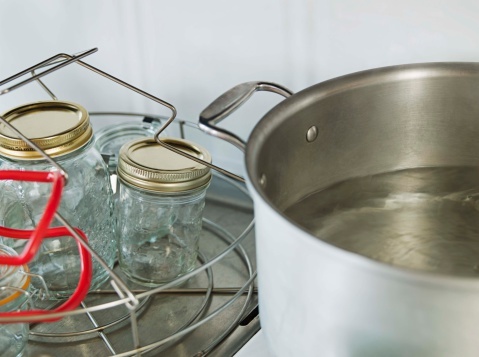 Without rinsing the pot, add 3 parts water to 1 part distilled vinegar to cover the burned food by at least 2 inches (5 cm). Boil for 10 minutes and then leave overnight.